Surprise! We are giving you a free Cracker template, an essential for any dinner table at Christmas time! Better yet, this fab shape will definitely impress your loved ones. 1. Print and cut out your free template. 2. Draw around your template on the back of your chosen sheet of Dovecraft Christmas Basics paper. Fold and score where indicated on your template. 3. Cut out the diamond shapes on your template. To make it easier, fold them in half and then cut each section out. 4. Add Dovecraft Perma Fix tape to the tabs on your template and adhere your cracker together. 5. Tie a length of Dovecraft Ribbon around both ends of your Christmas Cracker. 6. Thread two Dovecraft Christmas Basics Jingle bells on two lengths of Dovecraft and tie these to your cracker for the perfect finishing touch! 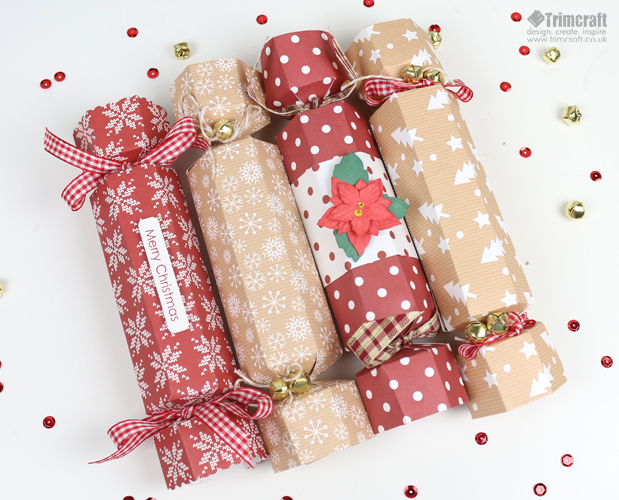 What an easy way to make your own Christmas crackers! We love the added embellishments to make it even merrier! Don’t adhere your crackers yet though as we have a fantastic template coming your way to help you fill your crackers in!